I have fond memories of various different hideaways I had as a child. There was the banana tree in the back yard of my great-grandma’s house where my brother and I had our own “personal” branch each, along with other branches which had specific functions and uses. 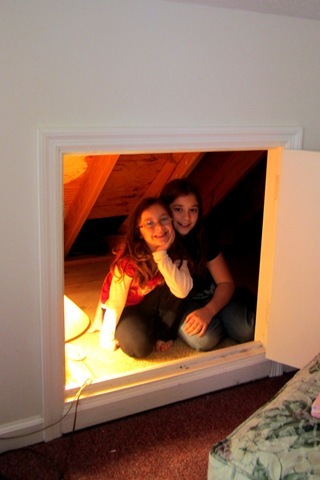 We spent many happy hours playing in the attic. I remember being devastated when we finally moved out of that house, knowing that my attic hideaway was going to be gone forever. My mom and step-dad have temporarily moved home (while they are renovating theirs) and the girls have found some new hideaways here in the new house. 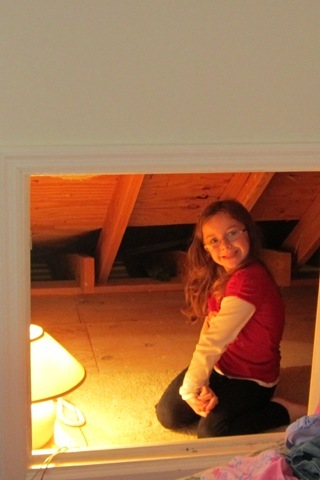 Their daddy set them up with little carpet remnants and lamps to light their spaces. 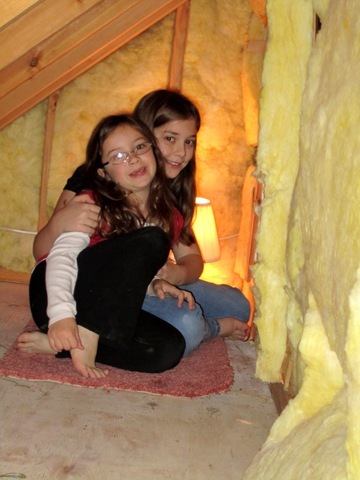 They each had their “apartment” with separate entrances in each upstairs bedroom, but they could visit each other by crawling across the attic space to each other. And so it goes – the circle continues. Two more little girls finding imaginary worlds and secret hideaways in the most unlikely of places – and yet finding entertainment and joy in the simplest of things.